This post contains affiliate links. Please click here to read more about our advertising policy. During my first pregnancy, I made lots of postpartum plans. I read up on infant development and sleep. I made freezer meals and grocery lists. I researched baby products tirelessly. I even bought a few things to help me get baby in shape after delivery, like this, and one of these! But I forgot to think about who would do the chores while I was holding and feeding the baby all day. The dishes were piling up in my sink, my floor wasn’t getting mopped, and I don’t even want to talk about the mounting laundry situation. Who was going to clean my house? I wasn’t doing the work. Hiring someone felt like a splurge I couldn’t justify. I needed to find a way to keep the house clean during postpartum life even though I didn’t want to do it myself. 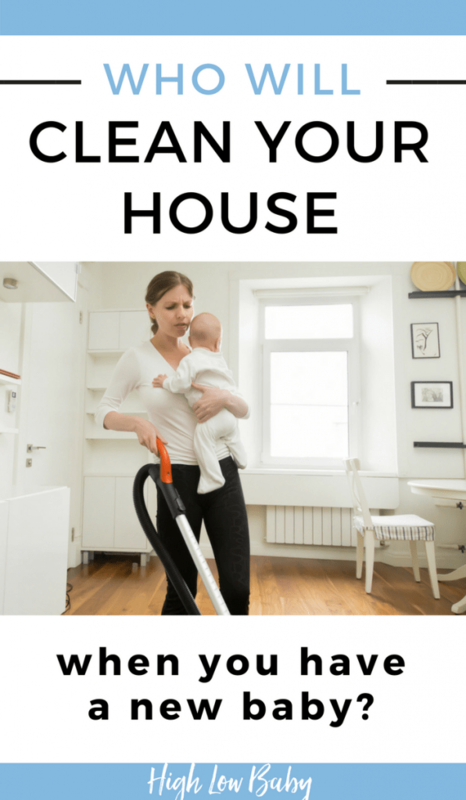 The truth is, it took me months and months to figure out a cleaning system that would work for me as a new mom. Housekeeping doesn’t come naturally to me. Initially, I felt a ton of resistance. I didn’t want the dishes to take up all my free time. But I also wanted to set an example for my daughter. I wanted her to wake up every day to a clean, organized, healthy home. Now that I have a system in place, I know how to implement it for the upcoming postpartum days. I want to share with you what has worked for me, so that you can have a plan and get those chores done even when you’re spending most of your time feeding and holding a baby. I owe a great debt to Clean Mama. Follow her on Instagram, buy her book, and she’ll teach you everything you need to know about having a clean house without spending all of your time and energy cleaning. I love her daily system that prompts me to do one big chore a day (ie: clean the bathroom, dust, vacuum, etc.) on top of a few basic everyday tasks like dishes. If you’re caught up on cleaning before having your baby (use that nesting energy!) then following this system should only take about fifteen minutes a day. I know I can do fifteen minutes a day–if I put my phone down, ha! I’m going to try to continue implementing this system as I clean during postpartum life. When I do one load of laundry a day, I’m never playing catch up. Sometimes it’s just a quick wash of all the kitchen rags. Other days, I’m washing baby clothes and linens (I use this unscented detergent and these dryer balls). I love that we always have clean clothes and fresh sheets. After reading the instruction manual that goes to my washer and dryer and I learned a lot! I had very little knowledge about what made each wash cycle distinct, and reading what the manufacturer intended brought many things to light. One organizing book I read recommended doing all wash cycles on the speed wash setting. I tried it but found it wasn’t really getting things clean. For my washing machine, the speed wash setting is intended for just a couple of items of lightly soiled clothing at once. Most of the time I use the cotton/normal setting, but I also use delicates for baby clothes and sanitize for anything gross. I honestly feel that using the right wash cycle makes a real difference. As a new parent, the things I read about chemical cleaners could easily put me into a cleaning paralysis. I wanted to clean the bathroom, but what would all of those noxious fumes do to me or my baby? This became just one more reason why I’d procrastinate getting the chores done. When I found Grove Collaborative, it was love. They offer tons of all-natural cleaning solutions that you can set up on an easy delivery schedule. (My absolute favorite is the Mrs. Meyers All-Purpose Cleaner.) Also, due to Clean Mama’s influence, I started using microfiber cloths in the place of paper towels. I’m never going back! I stocked up on microfiber towels and always have them handy for quick cleaning. Due to my Grove subscription, I always have the cleaning supplies I need on hand. If you’d like to try out Grove, you can click on my referral link and receive $10 off your first purchase with them. In short, I try to clean a little bit every day, get one load of laundry done, and keep my house well stocked with the things I need to clean. These three simple things will set you up for a clean house during the postpartum period! You don’t need to exhaust yourself. There’s no need to do everything all at once. You might not need to hire a maid service (though you’ve probably heard that advice a time or two by now). A few other things you need for the postpartum period: A good nursing bra and how to get better at changing dirty diapers.